We’ve covered a couple of Distimo reports in the past because they provide us with some valuable insights on Apple’s App Store and Google’s Android Market based on the startup’s in-depth analysis of publicly available data. Now the company has added RIM’s Blackberry App World store to the fray, which gives us even more data points to compare the rivals’ app pricing and whatnot. In the latest report (September 2009), Distimo notes software programs for Blackberry devices are considerably more expensive than comparable apps for competing devices/platforms. In fact, the average price for apps is more than three times higher than the one for similar apps in the App Store and Android Market, which is sort of unbelievable. There’s not a single category where the average price of an app is lower than its equivalent on the latter two application storefronts, and the more serious, business-related tools are definitely much more expensive. Just look at the difference in fees for apps in such categories as Finance, Productivity, Reference, News, Utility/Tools and particularly, Navigation/Travel in the chart below. Research In Motion has traditionally targeted more of a business audience with its product line, but is that enough of an explanation why developers are pricing their mobile software programs so much higher than their equivalents on the competing platforms? 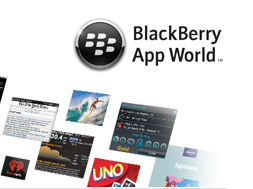 Or are Blackberry users simply more willing (and able) to pay for apps? If so, than the higher pricing is merely a result of simple relation between offer and demand. Either way, the difference in pricing is quite clear. Update: as commenter Cameron correctly points out, the minimum listing price for apps that get distributed on App World is $2.99, which is part of the explanation of the huge pricing differences (I doubt it’s the only reason). Note that the store is open for free applications as well (if they generate revenue after download). 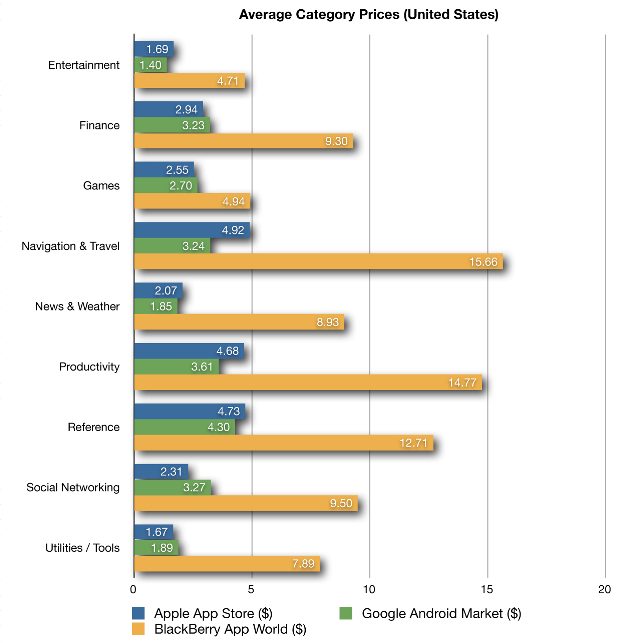 The chart also shows pricing of apps for the most popular listings in Apple’s App Store and Android Market are rather similar, with only Social Networking, Navigation & Travel and Productivity showing a bit of difference in asking pricing.